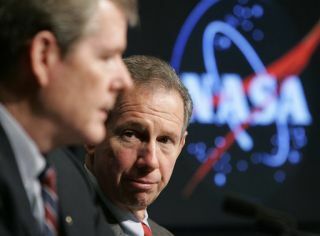 NASA administrator Michael Griffin, right, listens as Bryan O'Connor, a former astronaut and shuttle accident investigator, speaks during a news conference at NASA headquarters in Washington, Wednesday, Aug. 29, 2007 to announce that in a review released Wednesday, no evidence was found that astronauts were drunk or had been drinking heavily before any space launch. HOUSTON — NASA chiefMichael Griffin lamented the mandated 2010 retirement of the agency?s spaceshuttle fleet and the all-too-likely possibility that U.S. astronauts will beabsent from the International Space Station for extended periods in the futurein a leaked e-mail intended for top advisors. The Aug.18 e-mail, first reported Sunday by the Orlando Sentinel newspaper,includes candid remarks by the U.S. space agency Administrator, where helikened the push to retire the shuttle by 2010 as a ?jihad? toshut down the program rather than one based on engineering and programmanagement. Griffin also greatly detailed many of the themes present in the leaked e-mail during a Sept. 2interview with SPACE.com sister publication Space News. [Clickhere for a full interview transcript]. NASA isplanning to replace the space shuttle with its Orion CrewExploration Vehicle and its Ares I rocket booster, but the new spacetransportation system is expected to begin manned flights no earlier than 2014,leading to gap in U.S. spaceflight capability. Part of the reasonfor the hiatus, NASA officials have said, has been budget limitations that forcedNASA?s Constellation program overseeing Orion and Ares booster development topush back their internal manned launch test target by a full year last month. ?In arational world, we would have been allowed to pick a Shuttle retirement date tobe consistent with Ares/Orion availability, we would have been asked to deployAres/Orion as early as possible (rather than ?not later than 2014?) and wewould have been provided the necessary budget to make it so,? Griffin wrote inthe e-mail. Griffinalso expressed frustration over the likelihood that Congress would not extendthe agency?s ability to buy seats and cargo space aboard the Russian-builtSoyuz and Progress spacecraft beyond 2011 due to Russia?srecent military conflict with its neighbor state Georgia. Without theextension, and with the gap between shuttle retirement and start of Orionoperations, there will likely be long periods in which U.S. astronauts andthose of NASA partners are absent from future space crews. In astatement issued after the Orlando Sentinel posted Griffin?s e-mail, thespace agency administrator stressed that the memo alone lacked the appropriatecontext. ?The leakedinternal email fails to provide the contextual framework for my remarks, and mysupport for the Administration's policies,? Griffin said the NASA statement. ?Administration policy is to retirethe shuttle in 2010 and purchase crew transport from Russia until Ares andOrion are available.? NASA?sapproval to fly U.S. astronauts and cargo on Russian spacecraft comes under anexemption from the Iran-North Korea-Syria Non-proliferation Act (INKSNA). Inthe leaked e-mail, Griffin states that ongoing tension between Russian andGeorgia would likely prevent Congress from approving any exemption extensionthat would allow NASA to pay for additional Russian spacecraft. ?We mightget relief somewhere well down the road, if and when tensions ease, but myguess is that there is going to be a lengthy period with no U.S. crew on ISSafter 2011,? Griffin wrote. He alsoadded that Russia?s Federal Space Agency could operate the $100 billion spacestation without the U.S., and stressed that NASA would take no measures toforce the country to allowing U.S. use of Soyuz and Progress, such as denyingaccess to U.S.-built station power systems or other hardware. ?Practicallyspeaking, the Russians can sustain ISS without US crew as long as we don?tactively sabotage them, which I do not believe we would ever do, short of war,?Griffin wrote. ?We need them,? he later added. ?They don?t ?need? us. So we?rea ?nice to have.?? In hisSunday statement, Griffin stressed that the space agency does in fact have thesupport of the current Administration for the INKSNA exemption. ?The Administrationcontinues to support our request for an INKSNA exemption,? Griffin said in thestatement. ?Administration policy continues to be that we will take no actionto preclude continued operation of the International Space Station past 2016.? Last week,Griffin called on shuttle program managers to begin looking into what would berequired to extend thespace shuttle fleet?s service beyond the current 2010 retirement date. NASAofficials said the study was intended for preparation uses only in order to readythe agency to answer any space shuttle program-related inquires from the new incomingpresident and administration. Clickhere to see the Orlando Sentinel?s report and view the e-mail. Video - Back to the Moon with NASA's Constellation?????? ?